NOTE: The first time you connect to the conference grid, be on the look out for a Terms of Service notice that will pop up as an alert on your screen. If you do not accept the Terms of Service within 10 minutes, you will be disconnected from the grid! To connect and log in to the conference grid, you will need to use a special client called a “viewer”. We highly recommend attendees use the OSCC Viewer, a customized viewer we have configured specifically for the conference. Conference ticket-holders may also have one of two different types of accounts – a local account, which will have a first name and last name like “Joe Smith”, or a hypergrid account, which will be in the format firstname.lastname@yourgrid.com:8002. Refer to the email you received when you registered for the conference to see which type of account you selected. After downloading and installing the conference viewer, double-click the green and white OpenSimulator icon to launch the software. At the bottom of the screen, you will see a field to enter your avatar first and last name (example: Fleep Tuque) and password, and the 2013 OpenSimulator Community Conference grid should be pre-selected in the Grid pulldown menu. Enter your username and password and click the “Login” button to enter the conference grid. You should log in to a Landing Zone region that will have maps and signage to help you locate the appropriate Keynote region or Breakout Zone for your track presentation. 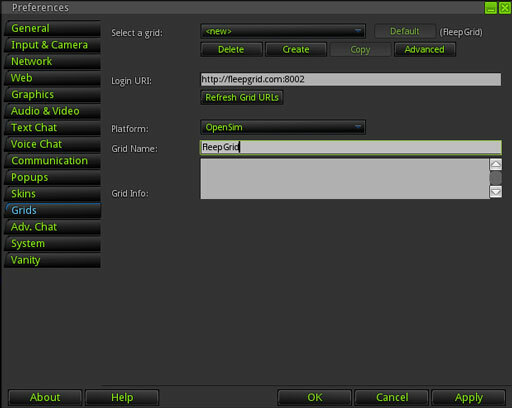 After installing and launching the conference viewer, you will need to add the connection details for your home grid to the OSCC Viewer grid manager. 2. Click the “Create” button at the top of the window that appears to create a new grid entry. 3. Enter the LoginURI of your home grid in the appropriate field. 4. In the Platform pull-down menu, select OpenSimulator. 5. Enter the name of your home grid in the Grid Name field. 6. Click the “Apply” button. You should now be able to enter your username and password, and select your home grid in the Grid pull-down menu to login. Once you have logged into your home grid, you will need to make a hypergrid jump to the conference grid. It is very important that you make sure your avatar has fully loaded on your home grid before making the hypergrid jump! If you do not wait for your avatar to fully load on your home grid, you may appear as a persistent cloud when you jump to the conference grid. Then click the “Teleport” button at the bottom of the screen to teleport to a Landing Zone on the conference grid. Experienced OpenSimulator users may wish to use their own preferred viewer client. If you wish to use a different client, it must natively support Mesh and Media-on-a-Prim in order to function properly for the conference . Imprudence and other non-mesh clients are not recommended or supported for the conference. Please note that conference staff will not be able to provide support for any viewer other than the OSCC Viewer. In the months and weeks prior to the conference, many members of the OpenSimulator community are assisting with load testing and other grid setup-related tasks. Anyone interested in the conference or the OpenSimulator software is welcome to participate in the load testing by making a jump from any other HyperGrid enabled OpenSimulator grid. Weekly load tests take place on Tuesdays at Noon PDT! We recommend using the OSCC Viewer or another viewer that can support voice and mesh, such as Singularity, Firestorm, or Kokua. 1. Log into your account on your hypergrid enabled grid. 2. If necessary, navigate to a jump region that can reach a destination in the 7000,7000 coordinate range. OSGrid provides public jump regions for this purpose, see the list at http://www.osgrid.org/index.php/hypergrid. 4. The map search should locate the destination region on the map, then click the Teleport button. If you find that the first region you try is full please use the next address on the list and so on. 2. Download and install the OSCC Viewer or a third party viewer that supports mesh, Media on a Prim (MOAP), and Vivox voice. We recommend Singularity, Firestorm, or Kokua.